Well-known here in the South West, Westpoint Arena is the centre for exhibitions, events, conferences and entertainment, a venue that brings the local community together for exciting events. Perhaps one of the most important for the county, the annual Devon County Show, held in May. With high volumes of visitors passing through the venue, the Westpoint team were in search of a new bathroom system that would reduce usage, produce significant financial savings and all-in-all promote a more economical system for the customers and the venue. We chose Essity & Tork, a leading global brand in workplace hygiene that is also committed to sustainability, not only for the planet but for businesses too. 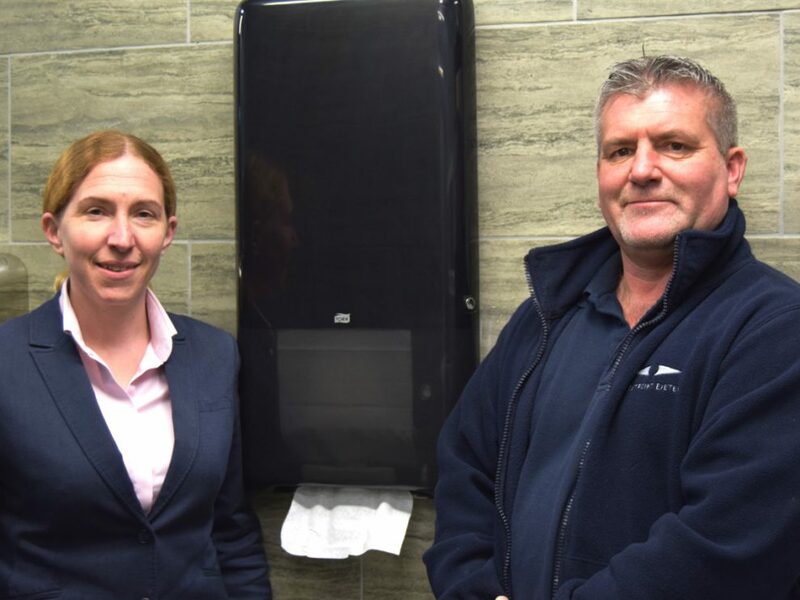 We supplied Westpoint with Tork Peak Serve Continuous Hand Towel Dispensers, which provide an innovative design for high-traffic washrooms. With features such as serving towels in three seconds reducing queue times and the capacity to hold 2100 towels to reduce refilling time. The Tork Liquid and Spray Soap Dispenser are also versatile, functional, and easy to use for cleaning staff, ultimately promoting hygiene for all washroom visitors. Finally, in the toilet cubicles, we also provide Tork Toilet Roll Universal 1 Ply, which is a modern and efficient system with a focus on guest satisfaction, it also has the Ecolabel and FSC label which guarantees that the product has been made of fibres from responsibly managed forests and other controlled sources. An increasing number of our customer now make a conscious effort to use products that are sustainable and that is a value as a company we also share. We take great care in sourcing products and manufacturers we know and trust. Essity & Tork have been awarded the European Eco-label, which means we can be confident that they meet high environmental standards in washrooms. Read the full testimonial from Site Manager, Ray Bater. Do you want to find out more about these products? Contact us today, for a chat.